Here is the life-sized historic photo of Mr. 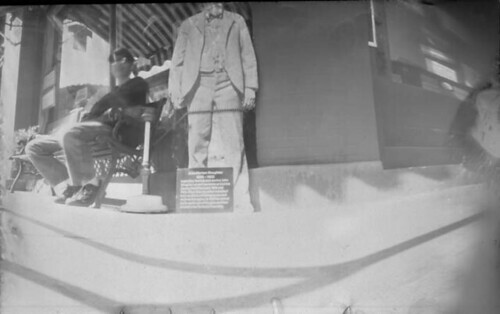 Slaughter on Main Street in Old Bisbee, Arizona, where he is on display this month, as part of the Cochise County History On The Move centennial project. My son is keeping him company on the bench to the left..
John Slaughter was born and raised in Texas, and was a Texas Ranger before relocating to Arizona in 1877. He carried a sawed-off shotgun which he called "the equalizer", and is credited for bringing much law and order to the wild Arizona Territory. He was the 4th Cochise County Sheriff, beginning with his election in 1886. Mr. Slaughter was also a rancher on his beautiful San Bernardino Ranch near Douglas, Az. (iti s now a historical landmark, and we have enjoyed visiting it several times) He was also key in establishing the community of Douglas.